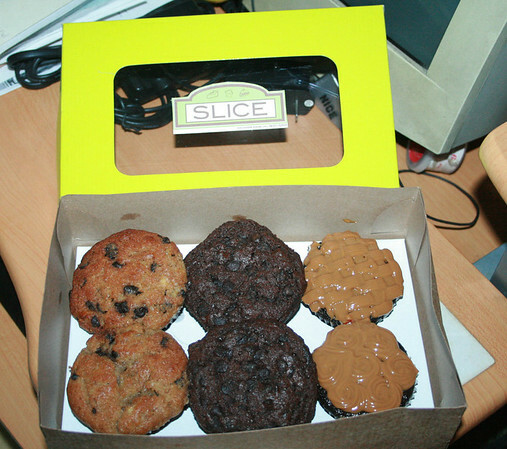 Hubs brought a box of 6 muffins from Slice once, because he keeps encountering it on Twitter. So, that first time, hubs had a box of different-fruit flavored muffins (because they ran out of chocolate ones). I forgot already which flavors because I only eat chocolate muffins. I do remember that the citrus burst one was too lemony, that both hubby and cousin said it left a bitter aftertaste in your mouth. It turns out, Sen. Pia Cayetano is the person behind this cafe, born from a love for baking she got from her grandmother. 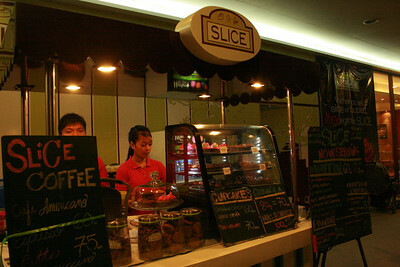 Good thing for Slice, they decided to make more of the popular choices to sell at all times of the day (because the choco madness one would usually run out first hour they're selling). Anyway, finally got to sample their more popular muffins. Suffice it to say, the choco madness is the best chocolate muffin I have ever tasted. Spare your stainless steel sink from plates, just devour the muffin by hand! Now, they are also offering cupcakes and are hoping to expand from their kiosk to be a true-blue cafe at Bonifacio High Street. They are even accepting advance orders for pick-up (orders have to be placed 24 hours ahead). Don't take my word for it though, just try their muffins. It costs P60 per muffin but if you get a box of 6, they become P50/each (so P300/box).